As you may have heard, there was a pretty big wedding across the pond this weekend. If you can’t get enough of the wedding excitement, or are planning your own, visit your Library! You can borrow the DVD of Will and Kate’s wedding if you want to see how it measured up to Harry and Meghan’s. This DVD purports to capture all the pomp and pageantry of the historic occasion like no other memento. It includes Kate’s arrival at Westminster Abbey, the full ceremony, the carriage procession, and the traditional balcony appearance at Buckingham Palace, plus highlights from the official BBC pre- and post-wedding coverage. It also includes William and Kate: A Royal Engagement – narrated by Sophie Raworth. If you’re planning your own more low-key affair, The green wedding: planning your eco-friendly celebration by Mireya Navarro will be of interest. This is a lovely book to look at, filled with beautiful photos. The author takes time to explain what makes each element of a wedding green — including the venue, gifts, invitations, decor and even includes the honeymoon and living “happily green ever after”. Are you a crafty bride-to-be? 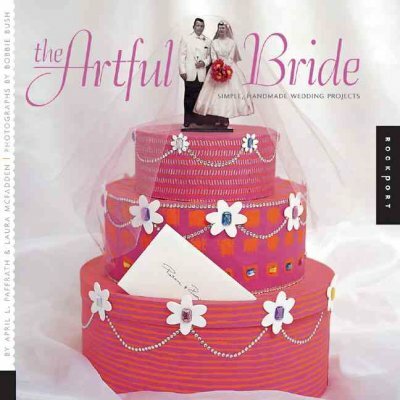 If so, check out The artful bride : simple, handmade wedding projects by April L. Paffrath and Laura McFadden. This book includes easy to follow instructions to make invitations, accessories, and decor. Type “weddings fiction” into our new online catalogue (search.tbpl.ca) and you’ll find a wide variety of stories about weddings. Titles range from the romantic For all time : a Nantucket brides novel by Jude Deveraux, to the mysterious Bagpipes, brides, and homicides by Kaitlyn Dunnett. If you prefer facts, Harry : a biography by Marcia Moody might be of interest. Published four years ago, this book doesn’t mention Meghan, but does chronicle Harry’s interesting life. His education, army career, social life, and public service are detailed. Popular royal biographer Lady Colin Campbells’ The royal marriages : what really goes on in the private world of the Queen and her family takes curious readers behind the curtains and dishes about royal relationships. Harry and Meghan have already graced thousands of magazine covers, and publishers will soon produce many books filled with their wedding pictures and stories. You can now place a hold on The Royal Wedding Album of Meghan and Harry, and be one of the first to sign it out. Joanna Aegard – www.tbpl.ca. If you have a comment about today’s column, we would love to hear from you. Please comment below!